Seattle, WA -- Sam Huff is one of the most remarkable individuals I have ever known. He grew up in a house without running water or indoor plumbing in a coal mine company town. At any early age he made up his mind that he was never going to work in the mines. He proved you can be whatever you want to be. A football scholarship to West Virginia University made that possible. He was an All-American. He is in the National Football League’s Hall of Fame. His number was the first retired by his college. Starting as a rookie in 1956, he led the New York Giants to six championships in eight years. He was captain of the greatest defensive team in football history. He played in five Pro Bowls, was named to the NFL 1950s All-Decade Team and is honored in the Washington Redskins’ Ring of Fame. Sam Huff was the first NFL player to be featured on the cover of Time magazine. He was he star of a 1960 CBS television documentary, "The Violent World of Sam Huff", narrated by Walter Cronkite. He is a successful businessman, horse breeder and sports announcer. For the past 20 years Huff and Sonny Jurgensen have broadcast the Washington Redskins games on radio. Another fierce rivalry was between Huff and Jim Taylor of the Packers. In the 1962 championship game Huff writes about one of the most memorable plays in football. “Taylor ran low and hard and his knees could hit you in the head. He never took the easy route and tried to find you so he could run right over you. He had the choice of running outside or cutting back inside and as he went to the sidelines I went with the flow. “Right in front of the Giants bench I slammed into him with every ounce of energy and strength that I had. I didn’t remember getting up, but when I did regain my senses I saw Taylor being taken off the field on a stretcher. Then an official told me to get a new helmet because of a large dent in mine. Our trainer ran on the field with a new helmet for me and I was ready for action when play resumed. The helmet is now in the NFL Hall of Fame Museum. In 1969 in the first game of his last season, when Huff was playing for the Washington Redskins, he hit New Orleans Quarterback Billy Kilmer so hard that Kilmer offered $100 to anyone who could get him out of a game. “Kilmer told me that years later and has never let me forget that hit,” Huff wrote. He writes how his “hometown” was Jamison Mine No. 9 Coal Camp near Farmington, W. Va. He was one of six children growing up in a rowhouse with no toilet or running water and how his father would come home from work completely covered in black coal dust. “Every day my mother would boil water so he could bathe in hot water in an old laundry tub. Jamison Coal and Coke Company owned the houses, stores and everything in the town. “Our elementary school had 100 students. A few miles away was Farmington High School with 700 students and all of the boys who grew up in a mining camp were expected to play football. We were one of the smaller Class B schools in the state and played against larger Class A schools. That’s how I met John Manchin, father of former governor and now senator Joe Manchin, who played a major role in my life. “When West Virginia University recruited me I was the happiest guy in the world and the first in my family to attend college. Growing up, I listened to the games on the radio by Jack Fleming and knew all of the players. Huff earned extra money with Joe Marconi parking cars at Mountaineer Field House for basketball games. In 1954 WVU great Fred Schaus was hired as the coach and neither had met his wife Barbara. At the first home game the two tried to charge her $2 to park. The next day they lost their jobs. In 1956 he was drafted by the Giants and signed a contract for $7,000. An outstanding baseball player, he also was signed by the Cleveland Indians. After one summer season with the Class A Reading, PA team he was told that while he could hit, he could not catch good enough to make it in the major leagues. There were no designated hitters then. There were 33 players on the Giants roster and most had to work part time. His wife Mary had a job and off-season Huff would even bag groceries in a Farmington market to make ends meet. Jim Lee Howell was the Giants head coach, Vince Lombardi the offensive coordinator and Tom Landry the defensive coordinator. Lombardi and Landry later became Hall of Fame coaches at the Packers and Dallas Cowboys respectively. Don Smith, the Giants’ public relations director, proved Huff’s popularity. 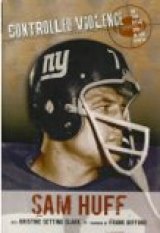 When the Giants played the Rams in Los Angeles, Smith addressed a postcard to “#70, New York City” and dropped it in a mailbox. A week later it was delivered to the Giants’ offices in Yankee Stadium. That wouldn’t happen today without a zipcode! In his book he describes what many call “The Greatest Game Ever Played,” the 1958 championship against the Baltimore Colts. The Colts won 23-17 in sudden death overtime. When Howell retired and former offensive coordinator Allie Sherman became head coach, Huff writes that ego could not stand having the media refer to the “Landry Defense.” One-by-one Sherman traded away the league’s best defense. Huff was the last, traded in 1964 to the Washington Redskins. At the Redskins he was reunited with Lombardi and began his friendship with Sonny Jurgensen, his partner for more than 20 years on the radio broadcasts. In 1960 Huff campaigned with and advised John F. Kennedy how to win the West Virginia primary which proved to be a decisive battleground in the presidential campaign. Kennedy, who had not faced serious opposition in the other primaries, suddenly faced a serious challenge from Hubert Humphrey. In order to secure the nomination Kennedy had to win West Virginia. Huff also was a successful businessman. As a stockholder in Marriott he knew that the hotel chain’s biggest problem was filling rooms on weekends. He met with Bill Marriott, son of the founder, and proposed that with his prior off-season marketing experience with Philip Morris and J.P. Stevens that he could sell college and professional teams to stay at Marriott Hotels where they played games. In 1987 Huff’s idea resulted in nearly $50 million in revenue for Marriott from sports-related business. He retired as a vice president after 27 years. I value our friendship of nearly 60 years and Sam will never let me forget that when he was named first team All-American on a number of teams he only made second team All-Southern Conference. “I did my job making All-American and Rene was responsible for my honors on the Southern Conference team,” he loves to tell people. Any sports fans, and especially all West Virginia Mountaineers, will enjoy reading Controlled Violence. Rene A. Henry is an author and writer who was born in Charleston, W.Va. and now lives in Seattle. He has been a close friend of Sam Huff’s since he was the Sports Information Director at West Virginia University from 1954-1956. Many of his commentaries are posted on his website at renehenry.com.